A Colossal Mural Chronicles 375 Million Years of Bird Evolution #ArtTuesday « Adafruit Industries – Makers, hackers, artists, designers and engineers! 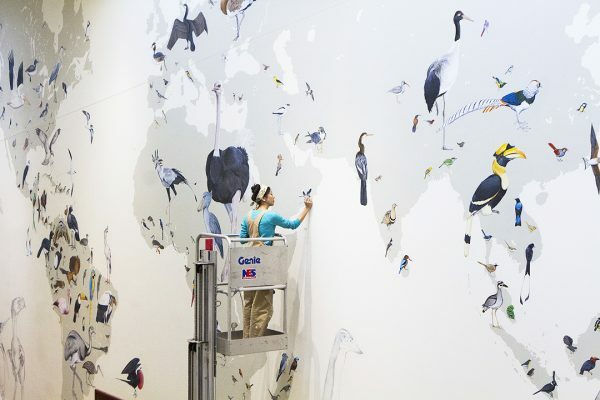 Artist Jane Kim spent three years creating a colossal mural at the Cornell Lab of Ornithology in Ithaca, New York. Arranged across a map of the world are birds painted life-size, from a Great Gray Owl soaring over Europe to the Common Ostrich, the world’s largest living bird, gazing with big bright eyes at the viewer. Each is part of a sprawling narrative on bird diversity and 375 million years of their evolution.